Professional ice hockey player for the Toronto Maple Leafs of the National Hockey League. He has also gone on to play for Canada's national team at the 2013 Maccabiah Games in Israel where he wont he gold medal. He also earned the CJHL Player of the Year award in the 2010-2011 season. He first began his junior career as a player for the Hamilton Red Wings in 2008. He was named rookie of the year. He then attended the University of Michigan where he went on to be captain his senior year. Upon graduation, he was drafted by the Florida Panthers in the 2010 NHL Entry Draft and in 2015 began playing with the Toronto Maple Leafs. In addition to his career in hockey, he is also a best-selling author represented by Penguin Random House. He wrote and published the award-winning children's book The Bambino and Me. He was born in Toronto, Ontario and grew up in Forest Hill, Toronto. He has four brothers; Spencer, Oliver, Cooper, and Shane. 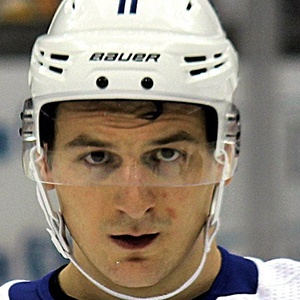 Other players known for their association with the Toronto Maple Leafs include Dave Dunn, Dave Keon, Norm Ullman, and Tyler Bozak.